Using this website and purchasing from The Dog Line constitutes your agreement to accept and abide by the following Terms and Conditions. These Terms and Conditions may be amended at any time without notice. Our products are designed to assist with the training and are referred to as a training aid - Improper use could violate state laws. Please check the legislation within your state or territory before purchasing any electronic dog training products. 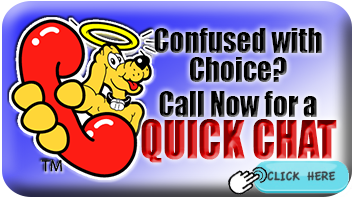 We will work with you to find a product that will solve your dog problem. Our team will always explain how our products work, a brief description of the necessary training and what the dog will experience. This will assist you in making a decision on purchasing a product best suited to the task. As you would expect each dog is different and due to its individual personality, temperament and its environment, we would be unable to find one product that would suit every dog and every situation. 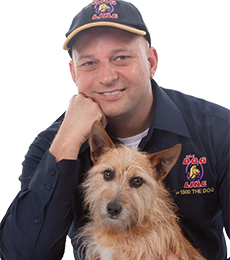 Our team will make recommendations as a guide to assist you in making an informed decision on which product you feel would be best for your dog's behaviour problem. If the product you purchased is working correctly but not achieving the desired results we can help. Our first step would be to work with you by offering advice on making minor adjustments and explaining further training. Our owner’s manuals are very thorough and will be able to assist you with most issues. It is essential the correct training is followed as our products are training aids. New Purchase upgrade. Simply notify us within 14 days of receipt of the product if it is not accomplishing the task and we will offer a full trade-in value to upgrade to a different product in the same category. You will receive the new product after returning the original product, return shipping, the difference in the price of the new product and the shipping are the responsibility of the purchaser. Please ensure that you fully understand how the products work and what the dog will experience. Returning a product because you have decided not to use it or changed your mind is not a reason for a refund. 3.2 Dog Fence 30 Day Money Back Guarantee. The Dog Fence Kits are not like buying a 'Television Set' where you plug them in and they work or they don't. We are dealing with dogs who all have different personalities and Temperaments. It is essential to set the system up correctly and follow the training and conditioning completely. **Note: This guarantee does not cover a change of mind or a change of circumstances (my dog passed away), if you decide you do not want the product or decide not to use it or decided to re-home the dog it is not a reason for return under this guarantee. 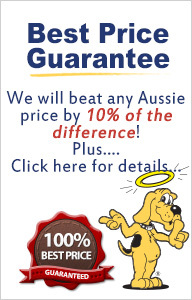 This Guarantee is valid for 30 days from the time of receiving the Dog Fence System. - (if not already done so) upgrade to the Premium Receiver Collar by returning the first collar and paying the difference in upgrade price. - Refit the Premium Receiver collar to a harness and follow the harness style retraining. The cost of the postage to and from is not refundable - The cost of any used wire (or open rolls of wire) is not refundable - A restocking fee will be applied after the deduction of these items. All of our products are covered by a Manufacturer’s Warranty available to the original purchaser only. Please refer to the manufacturers manual for their specific warranty. If a product is found to be faulty due to a manufacturers error within 15 days of the receipt of the product we will replace it at no cost to the customer with a new identical product. Our general warranty does not cover damage to the products, wear and tear, over-use or abuse, the depletion of consumables, such as batteries, straps, contact probes and wire, etc. The manufacturer will repair or replace the receiver unit (one per collar ordered) if it is chewed by the dog. This applies to one 'Chew Warranty' per collar purchased. The manufacturer Covers only the housing of the unit. Items such as Batteries, Battery lids, Straps, Probes and Washer sets are not covered by the chew warranty and will need to be purchased if needed. Warranty goods will be repaired or exchanged for a new or refurbished product. A fee related to workshop testing and repair will apply and costs related to postage will be the responsibility of the purchaser. The warranty is void if the product is used in ways that are outside the products intended use. Please note: The manufacturer has the final word on what they will or will not cover under warranty, their decision is final. All warranty returns must be accompanied by a copy of the original receipt. To ensure a speedy response returns should be accompanied by a letter of explanation detailing the problems to be rectified. Consumable items such as batteries, straps, wire, etc. are not covered by a manufacturer’s warranty or money back guarantee. They are not refundable if the product is working correctly. All costs for the return of any items or products will be the responsibility of the purchaser. Expenses related to workshop testing, labour and postage for returning the product will be the responsibility of the purchaser. All accounts are to be settled prior to the return of the product. Original delivery costs or their value are NOT refundable. A minimum restocking fee of 25% of cost will apply to all returns, after the deduction of consumable items. You have contacted us within 14 days of the purchase of the product and followed advice on adjustments to fitting, training and the correct use of the product. You have read and followed the instructions and training and the product has been used in accordance with the manufacturer's instructions. We have had the opportunity to assist with gaining success with the unit. You have followed and agreed to the procedure for returning a product. Please contact the phone number on your original invoice for the returns address. The return of any product is at the risk of the purchaser. We do not accept responsibility for packages whilst in transit. We recommend that you take steps to ensure that the item is traceable during postage and take out any insurance you may feel necessary. We are unable to accept any responsibility for the loss or damage of a product whilst in transit. Our E Collar products are training aids only and they are designed to assist you in training your dog. We do not recommend that any electronic training products be used on a dog that is known for aggression or used in an aggressive situation. Please consult a qualified vet or animal behaviourist if you feel your dog has aggressive tendencies. This is a rare occurrence and can be easily avoided by following some simple guidelines. It is essential that the dog’s skin is checked for signs of redness, irritation or sores of the skin. This will need to be done daily when first receiving the collar and we recommend regular checks thereafter. Regular cleaning of the probes and the strap will also assist. It is recommended that the collars are not worn for extended periods and that the collar is removed for 3-4 hours each day. Overly tight collars may increase the chances of soreness. We accept no responsibility for any veterinary costs related to the above. This issue is a result of incorrect care and maintenance. Please call for further advice and seek veterinary attention for your dog if necessary. The collars can NOT be used in conjunction with a lead to tether or walk the dog. Please also read the instruction manuals for further assistance and advice. We accept credit card payments over the phone using Visa and Master Card. Credit card fax authorisations are also available. Goods will be forwarded once credit card payments are processed. Eftpos facilities are available within the store. Our interest free payment plans are offered to approved purchasers. We offer three monthly interest free payments using a valid credit card. Terms and Conditions apply. Goods will be dispatched once the first payment is cleared. Please contact us for details of our bank account for direct deposit, internet transfer or over the counter deposit at your local branch of our bank. Please contact us via phone or email to advise of the deposit. Internet deposits can take up to 48hrs to reach our account where over the counter transactions will show up immediately (a cheque will take extra time to clear). We will be happy to contact you when the funds have cleared and the goods are dispatched. We offer a ‘Rent; Try; Buy’ Programme to approved purchasers on selected stock items. All rental plans are subject to our terms and conditions and require the provision of valid credit card details. For further information please contact our sales team. Converting to a purchase! Should you decide to purchase the rental product that you receive or swap over to a different model for purchase, we will use the rental fee and the deposit towards the cost of purchasing. Returning a rental unit! At the end of the rental period if you decide to return the rental unit we will refund your deposit via a credit card refund or cheque. The amount of the refunded deposit will be determined by the condition of the returned unit allowing for fair wear and tear. Any damage such as dog chews and serious scratching will reduce the amount of the deposit refunded. Late returns will attract a daily fee. Please contact us if goods will be late. We use Australia Post ‘E Post’. All items purchased and shipped via ‘E Post’ via Australia post. 'E Post' uses a trackable consignment number that will require a signature when receiving the goods. Goods in stock will be posted within one day of receiving an order. Standard postal times will occur. Express ‘E post’ orders are available for an additional fee. Please contact us for courier services and overnight postal bags. The Dog Line Pty Ltd and The Dog Line and it's associated companies will not be liable for any loss or damage direct, indirect or consequential related to the use, misuse or inability to use the products supplied. The purchaser assumes full responsibility. Any information we receive via this web site or directly will be considered private and will not be passed along. 13.) Any costs incurred for debt collection will be the sole responsibility of the customer. By creating a listing in TDLD you agree to abide by and be governed by these terms and conditions. Additional terms and conditions may be posted on the web site from time to time without notice. We recommend you revisit these Terms and Conditions to keep up to date with any changes or additions. Trademarks belonging to The Dog Line and third parties may from time to time be displayed on the web site. Express written permission from The Dog Line or the relevant owner of any Trademark/s is required prior to any use or copying. Listing in our directory cannot be construed as granting any licence or right of use of any Trademarks. The use and listing within TDLD is conditional upon the observation of socially acceptable and lawful standards. You agree to abide by these terms and conditions and codes of conduct, updated from time to time without notice. The code of conduct will consist of but not be limited to the following..
upload, post, e-mail, transmit or otherwise make available using the web site any material that you do not have a right to make available under any law or contractual obligation or which contains viruses, or other computer codes, files or programs designed to interrupt, limit or destroy the functionality of other computer software or hardware. TDL reserves the right to monitor, cancel, hide or delete any listings or information that in the opinion of TDL does not comply with the code of conduct or the nature of the website. Any fees or contributions paid will be forfeited and non refundable. Occasional down time due to updating and maintenance will occur from time to time. We endeavour to provide constant access to the site, however we cannot guarantee this. We do not accept any responsibility or liability for interruption, delay or down time of TDLD or website. Individuals and individual advertisers are solely responsible for the content of any material or advertising material which is submitted to us and published on the web site, including ensuring that it complies with relevant legislation. We accept no responsibility for the content of any advertising material published on this web site. Without express written permission of TDL no company or business selling or offering the same or similar products and or services will be permitted to advertise or create a listing on TDLD. TDL reserves the right to remove or refuse any listing or advertising at its discretion, any fees collected for the listing will be forfeited without refund. Any inappropriate advertisements or listings will be removed without refund if applicable. Any businesses or companies who disagree with or dispute the use of any of the products offered by TDL will be removed from the directory or advertising without refund if applicable. Directory Listings and or Advertisements will expire if not renewed by their individual due date. This website is available as a reference service to dog owners and the general public. The links to other Web Sites. This directory is provided by The Dog Line (TDL) - access to and the use of the information contained within the directory www.thedogline.com.au is provided under the following Terms and Conditions. The Dog Line Directory; (TDLD). The use of the information, the services and products contained within this directory should only be undertaken on the condition that these Terms and Conditions have been fully understood and accepted prior to using the directory. If you do not agree to our terms and conditions then please do not use the directory to obtain or make use of the information, services or products it contains. We would welcome you feedback on the directory and the Terms and conditions, we will always endeavour to make improvements that will benefit all. We (The Dog Line) reserve the right to alter these terms and conditions from time to time without notice and recommend you visit our Terms and Conditions regularly to keep up to date with these changes. Whilst we take every care to ensure the information contained within TDLD is accurate, the information is provided in good faith only and The Dog Line is not responsible for its accuracy. Please note that any pricing displayed in TDLD listings may not be current and would require further information and confirmation from the individual business listing. Whilst we endeavour to keep the links to other websites current, relevant and accurate, they are provided for you convenience only. By using the links on this website you understand that we have no control over these websites or their content. We do not endorse, approve or recommend the content nor do we have any relationship with the owners or producers of those websites. We recommend you do your own investigation as to the suitability of these websites. We endeavour to offer services of the highest quality for you and your dog in TDLD, however The Dog Line does not offer any warranties, conditions or other terms as to the suitability or quality of the services to any purpose you select them for. It is not advisable to rely solely on the information contained within TDLD when making a decision on the services to acquire. TDLD is not liable for any direct or indirect losses (financial or otherwise) relating to profit, income, goodwill or contracts arising from any contract or negligence in connection with the use of this website. Any Implied warranty or connection permitted by law where TDL cannot be excluded is limited to the cost of replacement of the services or supplying the services again. By using TDLD you indemnify TDL and all of its associates including but not limited to its employees, affiliates, agents, contributors and any licensors or content providers against all liabilities, costs or losses and any legal fees incurred by you or TDL that result directly or indirectly from your accessing or using TDLD. Please feel free to download, print, display or forward the information contained within TDLD. The information however remains the property of TDL at all times and permission is granted on the condition that it is purely for personal use and not of any commercial nature. Any other uses whatsoever except where permitted by the Copyright act of 1968 will require the permission of TDL. Thank you, we trust you will find the information contained within our directory of assistance to you and that it will help build the relationship that you have with your dog.